We are delighted you will be joining us for your child’s dance education. Please do not hesitate to call the office should you have any questions regarding the registration process, tuition rates, fees, or creating your on-line dance account. Your space in class is reserved upon receipt of your registration form & fee, emergency medical form, and payment of first and last month’s installment. For tuition rates, click here. By its very nature, dance is physically demanding. In case of injury, parents and/or legal guardians grant UDS permission to administer first-aid as needed and waive the right to any legal action for such injuries sustained on studio property; either before, during or after class, or through participation in any community dance performance. A completed Emergency Medical Form is required at registration. Students with injuries (dance related or otherwise) must submit a doctor’s note to be excused from and readmitted to class. However, it is the instructor’s discretion if a student should join in all class activities and/or perform in the annual recital. 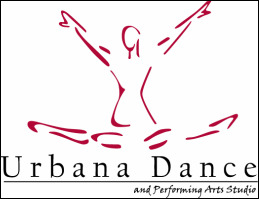 Upon registration parents/guardians grant permission for Urbana Dance Studio to photograph and video minor students to be used in promotional materials including but not limited to printed materials, advertising, website, facebook, youtube, DVDs and other marketing materials. Further, such materials become the sole property of Urbana Dance to be used by others only with express written permission and without compensation.